Now we are sure that we are not the only ones who believe that Ruckus Unleashed is perhaps the coolest name for a product!! It brings forth all manner of movies, TV show or even a great name for a wrestler! Just so cool! Suffice to say Ruckus Unleashed is not any of the above rather Ruckus Unleashed is a controller-less wireless LAN solution that enables SMBs to deliver an optimal wireless experience at an affordable price point. Aimed at small to midsize business, it is the controller-less access point solution. This basically means, wait for it …. zero licensing fees! Ruckus Unleashed is ideal for SMBs who are interested in providing high RF performance Wi-Fi that is easy to deploy, at a low price. Furthermore, Unleashed is a scalable solution, which meets the growing needs of the SMB market. A small deployment with up to 512 devices, such as a hotel, individual and independent retailers, warehousing and local services such as private insurance/title companies is ideal for Unleashed. In this segment, retailers have limited budget and little to no IT staff to manage the network. Ruckus Unleashed enables them to provide a reliable network in addition to value-add services, such as guest access, captive portal and Hotspot/WISPr. Check out some of the great Ruckus Unleashed products we stock here at Comms Express. Smart devices are playing a critical role in influencing customer decisions and behaviours. While Wi-Fi devices have become an absolute requirement for customers and employees, small to midsize businesses (SMBs) are challenged to deploy a reliable wireless network within a limited budget and little to no IT staff. Ruckus Unleashed is a controller-less wireless LAN solution that enables SMBs to deliver an optimal wireless experience at an affordable price point. Configured in 60 seconds and deployed in minutes, Ruckus Unleashed eliminates the complexity pitfall of a controller-based WLAN. With easy migration options to the Ruckus ZoneDirector, SmartZone or future Ruckus platforms, Ruckus Unleashed scales with the business. Now SMBs can deliver a Wi-Fi user experience with high RF performance and network resiliency. • Seamless connectivity with hotspots/WISPr setup in minutes. • Give guest access quickly, but more importantly, securely. Including email or SMS access. 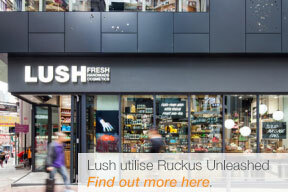 With so many specialist features is it any wonder that Ruckus Unleashed are causing a great ‘ruckus’ within the industry? We look forward to our continued working relationship.